The dates have been set for this year’s Second Life anniversary celebrations. SL13B will kick-off at noon SLT on Sunday, June 19th, and run for a full week of celebrations, entertainment and activities, through until Sunday, June 26th, 2016 inclusive. The theme for 2013 is The Shared Adventure. What does adventure stir in you? Is it an endless vista of unexplored jungles and ocean depths, a space opera, or even intrigue in dimly lit alleyways. What dangers are afoot, and how will you and your cohorts seek to overcome them? In keeping with the shared experience theme, and in a departure from previous SL13B events, the organisers are inviting Second Life creators and builders to apply for the chance to design and build one of the celebration’s entertainments stages or public areas. The Cake Stage: the centrepiece of the celebration, spanning a square of four regions with a total available LI of 32,000 (8,000 per region, with the stage expected to straddle the corners of all 4 regions). The cake can be constructed in whole or in parts from prims, mesh or sculpts, with mesh preferred. The Live Stage: for singers and “live” entertainments and set within a single region with a 10,000 LI allowance. The stage needs to be suitable for solo acts as well as moderate ‘band’ sized acts, with the successful applicant responsible for developing the entire region. DJ Stage: straddling two regions with a total LI of 10,000, this stage is for DJ and other pre-recorded acts. The successful applicant is responsible for the decoration of both regions. Stage Right: again straddling two regions and with a 5,000 LI allowance, this stage will be used for a mixture of DJ and live entertainment, with the successful applicant once more responsible for developing both regions. The Welcome Area: Taking up a full region and with a LI allowance of 8,000 and a total ground area of 57,600 square metres, the Welcome Area is the point at which the majority of visitors will arrive at the celebration regions. Again, please note that the above descriptions offer a brief outline of the build requirements for each area, all of which have very specific requirements which must be considered when applying. for full details on these, please refer to the SL13B Infrastructure Build Requirements. If you are interested in applying to design and build any of these areas, please email either doctorgascoigne-at-gmail.com or diana.renoir-at-gmail.com or contact them in-world. General applications from builders, exhibitors, performers and presenters will be announced in due course, as will a call for volunteer helpers and greeters and the opportunity for bloggers to apply for early access on the Press Day. Keep up-to-date with all things SL13B through the SL Community Celebration Website. Caitinara Bar, the casual venue for music and relaxing at Holly Kai Park has been operating weekly series of DJ-led music events for the last couple of months, and has gained a small but loyal following – thank you to everyone who pops along! 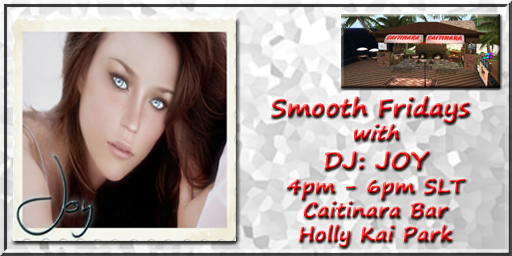 We’re now very pleased to announce that starting on Friday, March 25th, Joy Canadeo will be joining the line-up with Smooth Fridays with DJ Joy, a two-hour session of music from 4:00 through 6:00pm SLT, to soothe away the cares of the week and help us glide into the weekend. Caitlyn and I are looking forward to welcoming Joy to Caitinara, and very much hope you’ll be able to join us as well, every Friday from the 25th onwards, for Smooth Fridays with DJ Joy. Don’t forget: every Wednesday at the same time (4:00 til 6:00pm) we have Music with Anthony, bringing a blend of genres and themes to get us over the mid-week hump with Anthony Westburn. We’re particularly pleased to be able to announce that from Wednesday, April 6th, Music with Anthony will be presenting a monthly opportunity for people to have a little costume fun with out new Dress Up theme evenings. We’ll be kicking these off on April 6th with The Spies Who Loved Me, a celebration of Bond, Bourne, Baur, Bristow (Sydney, that is), Black Widow, femme fatales and criminal mastermids with songs and hits from the movies and famous spy-ish TV shows. We’ll have full details of this new monthly series on the Holly Kai Park blog soon! Then on alternate Sundays, Kess Crystal presents Feel Good Sundays – music to get you into a positive, upbeat mood ready to face the week ahead. Kess will be back at the bar on April 3rd, and then on April 17th, with a mix of indie, pop, and more to keep us dancing and spirits high – so why not join us to round-out your weekend? You can keep up with all of the activities at Caitinara Bar and at Holly Kai Park through the Holly Kai website and blog, which has all events listed in the Holly Kai Park calendar. So why not bookmark that as well? The following notes and audio were taken from the weekly Bento User Group meeting, held on Thursday, March 24th at 13:00 SLT on Aditi. For details on each meeting and the location, please refer to the Bento User Group wiki page. Recent efforts within the Bento project have been on trying to hook the appearance sliders up to the new skeleton so that they might be used to adjust various Bento bones. This involves a fair amount of work, as the sliders apply morphs to the basic avatar form, and for Bento enabled meshes they need to be able to operate with bone positions / rotations. Gaia Clary and Matrice Laville have been working on this, and have identified a slider parameter which can be used to achieve just this, and have been specifically looking at using the facial sliders (given the face / head is one of the largest collections of new bones), as shown in the video below. The “downside” of this is that this requires further work on the Bento skeleton, includes the possible addition of further bones, which are currently under consideration. This means that there will at least one further update to the viewer, which will contain the updated slider capabilities and some updates / fixes for the skeleton. It is hoped that this will surface in week #13 (week commencing Monday, March 28th); however, this is dependent upon final updates and getting the viewer through the Lab’s QA. Once it has been issued, the Lab is particularly keen to see the spine bones exercised within this viewer once released, as these have been causing some problems (see my last Bento update). One potential addition to the skeleton is a set of teeth bones, as described by Cathy Foil in the meeting. Again, it’s not certain these will make the final selection, but the potential with them is interesting. Currently, the most direct way to obtain the latest version of the Bento Skeleton is via the latest version of the Bento viewer installed on your computer (e.g. C:\Program Files (x86)\SecondLife\character) and using the Avatar_skeleton.XML and Avatar_lad.XML files – the latter of which contains the shape slider capabilities. The major reason the skeleton files haven’t been updated on the wiki is because the skeleton has been going through updates and changes, and Vir has been concerned about any version put on the wiki becoming out-of-date. Troy Linden, the product lead for Bento indicated that current thinking among the product team at the Lab is that Bento will likely move to the main (Agni) grid some time in the second quarter of 2016. This doesn’t mean the project will necessarily be declared complete by then, but it does mean that the Lab expect to have all major skeleton and viewer work wrapped up, with the emphasis firmly shifting to more widespread testing, together with any required bug fixing. Vir did caveat this with the point that there could be reasons – significant bugs, other work requiring release, etc., – which might cause this to slip, but the focus would appear to be firmly on moving Bento to Agni some time between April and June 2016. It is unclear how widespread this issue is, or what the precise cause is. Currently it has only been noted with GOS shoes / feet, and manifests in the Bento viewer in the left foot / shoe appearing incorrectly aligned to the left leg when worn, as shown in the image on the right – note the left shoe / foot appears partially rendered because it has “sunk” into the terrain. Details of the issue can be found in BUG-11617. One suggestion put forward is that the issue is down to the very high poly count used in these shoes / feet; another that it might be due to the shoes feet being uploaded as individual mesh models, which might be creating issues. However, why either of these cases should be so is unclear: the feet / shoes render correctly in non-Bento viewers, and there have been no intentional changes made to the rendering pipeline for Bento. A further suggestion is that it might be a result of attempting to rig to and animate an attachment point; it may even be related to an old issue of float issues in the LLVolumeOctree (BUG-2058 – see FIRE-8266 for a public version). The issue has been accepted by the Lab as a bug, and will undergo further investigation on a number of fronts, including obtaining versions of the items seen to be exhibiting problems, testing the effect using other high poly count objects, etc. There is also a possible issue with the mesh uploader failing to recognise the revised Bento wing bones as bones. This apparently manifests itself by a refusal to upload rigged wings weighted to the wing bones. The next Bento meeting will take place on Thursday, March 31st at 13:00 SLT. The meeting following that should be on Thursday, April 7th, but the time is TBC, so as to avoid it clashing with a Lab internal meeting.